How to apply for NTA UGC NET /National Eligibility Test June 20 to 28 2019 at ntanet.nic.in: NTA UGC NET 2019 to be held on June 20 to 28, registrations to begin from March 1 at ntanet.nic.in. NTA has announced the examination dates for National Eligibility Test (NET) 2019. The NTA UGC NET 2019 will be held on June 20 to 28, 2019 (Sunday). The NET exam is conducted for determining the eligibility of Indian nationals for the eligibility for Assistant Professor only or Junior Research Fellowship and eligibility for Assistant Professor both in Indian universities and colleges. 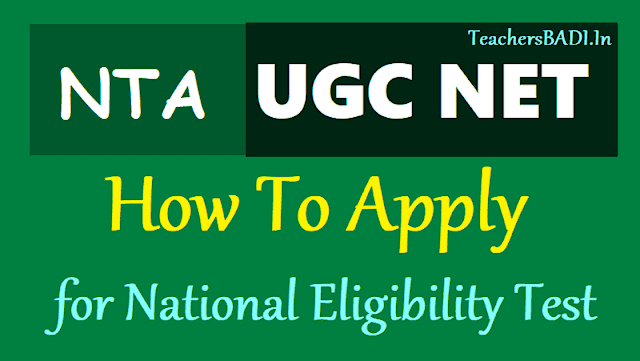 National Testing Agency, NTA would begin the registration for UGC NET 2019 June examination from March 1, 2019. Candidates interested in taking up Assistant Professorship or apply for Junior Research Fellowship (JRF) programs need to apply online on ntanet.nic.in. The examination would be conducted on 20, 21, 24, 25, 26, 27 and 28 June 2019. The result for the examination is expected to be released on or before July 15, 2019. The eligibility criteria would remain the same as was for UGC NET December 2018 examination. The certificate would be however given by UGC. Paper I and Paper II would be conducted as was the format in December 2018. The age limit for JRF is 32 years. There is no upper age limit for Assistant Professor Examinations. UGC NET 2019: Registration process to close on March 30: The online window for the National Eligibility Test (NET) June 2019 registration process will be closed on March 30. The admit cards will be available for download from June 11 and the results will be released on July 09, 2019. The examination is scheduled to be conducted from June 20 to 28, 2019 in 84 subjects at 91 selected cities. It is held for eligibility for Assistant Professor post only or Junior Research Fellowship (JRF) or both. The candidates can pay registration fee till Jul 1. From this year, NTA will conduct the exam and instead of 3 papers, there will be only 2 papers – paper 1 and paper 2. || Paper 1: It will be of 100 marks and will contain 50 objective type compulsory questions. Each question will carry 2 marks and will be of general nature and will test the teaching/research aptitude of the candidate.The duration of the same will be one hour (9:30 am to 10:30 am). || Paper 2: It will be of 100 marks and will contain 100 objective type compulsory questions. Each question will carry 2 marks and will be based on the subject opted by the candidate. The duration of the same will be two hours (11 am to 1 pm). Those who have obtained at least 55 per cent marks in master’s degree or equivalent examination from universities/institutions recognised by UGC in humanities and social science, computer science and applications, electronic science etc. Those who are pursuing their master’s degree or have appeared for the same (final year) and whose result is still awaited can apply. The candidates who can qualify for JRF will be eligible to receive fellowship of UGC under various schemes. The validity period of the offer will be three years. Candidates can appear in the subject of their post graduation only. Educational Qualification: Candidates need to secure at least 55 per cent marks in Master’s degree or equivalent examination from a recognised universities/institutions. There is five per cent relaxation for OBC, Scheduled Caste(SC)/Scheduled Tribe(ST)/ persons with disability(PwD) category and transgender candidates who have secured at least 50 per cent marks (without rounding off) in Masters degree or equivalent examination. Those who are pursuing their Master’s (in the final year) can also apply. Such candidates must complete their Master’s degree or equivalent examination within two years from the date of NET result with required percentage of mark. The upper age limit for appearing in JRF has also been raised by two years, i.e. from the existing upper age limit of 28 years to 30 years. However, the age relaxation will be same as it was earlier. || Junior Research Fellowship (JRF): The upper age limit for appearing in JRF has been raised by two years, i.e. from the existing upper age limit of 28 years to 30 years (the relaxation as earlier will remain same). || Assistant Professor: There is no upper age limit: Age limit increased: The age limit has been raised by 2 years. Earlier, the upper age limit for appearing for JRF was 28 years, but now, it has been increased to 30 years. Fill in the Online Application Form and note down system generated Application Number The candidate should supply all the details while filling the Online Application Form and also required to choose PASSWORD and Security Question and enter his/her Answer. After successful submission of the data, Application number will be generated and it will be used to complete the remaining Steps of the Application Form and also required for all future correspondence. For subsequent logins, candidate will be able to login directly with his/her respective system generated Application Number and chosen Password. For Payment by Syndicate Bank/ ICICI/Canara Bank challan: The candidate has to select bank (Syndicate/Canara/ICICI) to deposit the application fee through e-Challan mode. As soon as he/she selects, an e-Challan will be generated containing specific details of the candidate along with amount to be paid. The candidate has to take a printout of the same and take it to the nearest branch of the selected bank for making payment. After the confirmation of fee deposited from Bank/NTA, the candidate will be able to print the Confirmation Page. Payment by Debit/Credit Card:The candidate has to select Debit/Credit Card option to pay the application fee and follow the online instruction to complete the payment of fee. After successful payment, candidate will be able to print the Confirmation Page. The Candidate should take print of Confirmation Page and keep it for future reference. The Confirmation Page should not be sent to NTA. Step 1: Go to the official website of the Commission. Step 3: If you have not already, register to the site and login. Step 4: Enter your details in the fields provided and upload the necessary documents. Step 5: Submit the application and save a copy for further reference. 3. Paper I shall consist of 50 objective type compulsory questions each carrying two marks. 4. The questions will be of general nature, intended to assess the teaching or research attitude of the candidate. 3. Further, Paper-II shall consist of 100 objective type compulsory questions each carrying two marks which will be based on the subject selected by the candidate. NTA now conducts this exam on behalf of UGC for the post of Lecturer and for providing the JRF for Indian nationals in order to ensure minimum standards for the entrants in the teaching profession and in research. For any query, candidates can check out the official website.